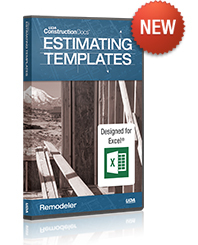 Estimate with ease and accuracy with a complete package of estimating templates designed for Remodeling and Renovation. Estimating templates can be modified to fit your project needs and are provided as spreadsheet files for Microsoft Excel and most other spreadsheet applications. UDA Estimating Templates are backed by UDA Technologies, an industry leader in construction technologies with clients in over 60 countries worldwide. Save over $90 by purchasing UDA Pro Excel® Templates for $149.99, including Light Commercial, Residential and Remodeler Excel® Templates. Learn more.